More than 1 million species have been identified in efforts to catalog living species. 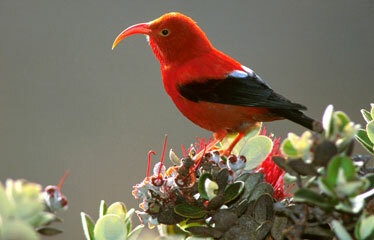 Shown is the iiwi, found on the main Hawaiian islands. WASHINGTON » A worldwide scientific effort to catalog every living species has topped the 1 million milestone. Six years into the program, the total has reached 1,009,000, researchers report. They hope to complete the listing by 2011, reaching an expected total of about 1.75 million species. Thomas Orrell, a biologist at the Smithsonian's National Museum of Natural History, said the finished catalog will include all known living organisms, from plants and animals to fungi and microorganisms such as bacteria, protozoa and viruses. "Many are surprised that despite over two centuries of work by biologists and the current worldwide interest in biodiversity, there is presently no comprehensive catalog of all known species of organisms on Earth," Orrell said. The listing does not include fossil species from the past. The Integrated Taxonomic Information System-Species 2000 Catalog of Life provides access to data maintained by a variety of scientific organizations, each specializing in a certain area. For example, data on dipteran flies is maintained by the Agriculture Department's Systematic Entomology Laboratory at the Smithsonian's National Museum of Natural History. Natural history museums in London, the Netherlands and New York maintain clothes moth, dragonfly and spider data. Experts in Canada and Paris keep the data on Ichneumon wasps and longhorn beetles. These lists are peer-reviewed and checked technically, then integrated into special software for the catalog. The project, involving some 3,000 biologists, is led by Frank Bisby of the University of Reading in England and Orrell. "We tidy it up and do a peer review to see which pieces are the best ones to use, like putting together a giant jigsaw puzzle," Bisby said in a recent interview. "If you want to do international comparisons, you need a master list. It's a little like if you were running a supermarket, you would have to do an inventory." Having internationally accepted standards for species' names will help researchers compare the diversity of life in various regions of the world and produce uniform catalogs of germs, packets of seeds or genetic resources, he said. Only rarely is there competition among names, such as occurred with sea anemones, hard corals and spiders, and occasionally an element of subjective opinion plays a role among the peer reviewers with various taxonomic skills, Bisby said. Taxonomy, the formal system of naming living things, was launched by the Swedish scientist Karl von Linne - known as Linnaeus - in the 1700s, and his name still appears in the database. The biggest section of the database currently is LepIndex, listing 253,680 species of lepidoptera, which are butterflies and moths. At the small end of the scale is a database that covers 86 species of krill, the tiny shrimplike creatures that whales eat.